Following graduation from the University of South Carolina School of Law, Pat Flynn began his legal career as a law clerk for United States District Judge Falcon B. Hawkins in Charleston, South Carolina. 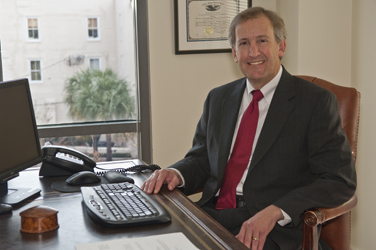 He is a member of the Charleston County, South Carolina and American Bar Associations, and is licensed to practice before all state and federal courts in South Carolina as well as the United States Court of Appeals for the Fourth Circuit. He received his Bachelor of Science degree in Accounting from the University of South Carolina in 1985 and, following graduation, he received his commission as an officer in the United States Navy. He served on active duty aboard the destroyer USS Hayler, and as a Staff Officer for a three-star Admiral in command of Navy Surface Forces in the Atlantic. He left active duty in 1989 to enter law school and continued his service as a Navy Reserve Officer from that point to the present, having now attained the rank of Captain, USNR. While practicing law in Charleston, he served as a reserve officer aboard the frigate USS Fahrion, as well as other reserve billets in South Carolina and Washington D.C.
Pat served on the Charleston County Public Library Board of Trustees from 2003 through 2011, including service as chairman from 2006 to 2009. He presently serves as the Vice Chairman of the Supervisory Committee of the South Carolina Federal Credit Union, which has assets over $1 billion, making it one of the top 100 credit unions in the United States.